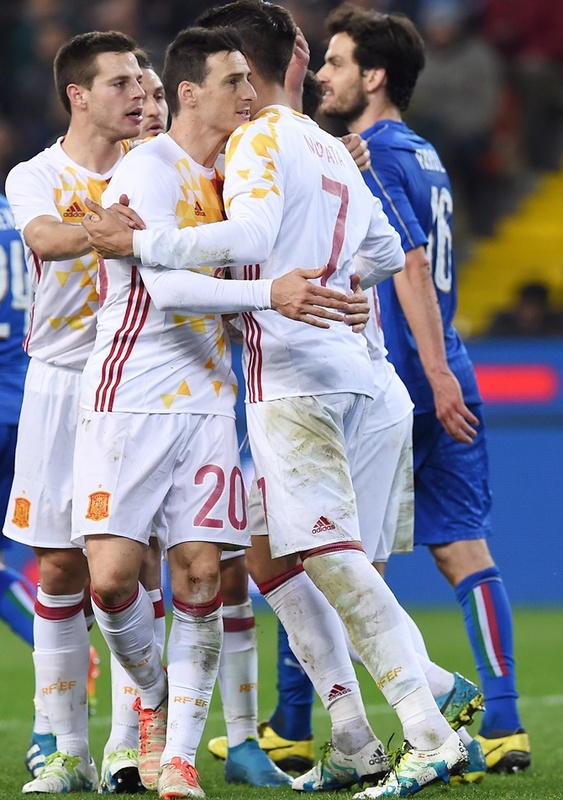 IMAGE: Spain's Aritz Aduriz Zubeldia, centre, celebrates a goal with team-mates during the international friendly match against Italy. Photograph: Valerio Pennicino/Getty Images. Aritz Aduriz scored his first goal for Spain at the age of 35 to give the European champions a fortuitous 1-1 draw away to Italy in a Euro 2016 warm-up for both teams on Thursday. Lorenzo Insigne, playing his first international for two years, ended Spain's run of six successive clean sheets when he finished off a counter-attack to give the hosts a deserved lead midway through the second half at the Stadio Friuli. But Aduriz, who made his only previous appearance for Spain six years ago and was recalled thanks to his prolific form with Athletic Bilbao, replied three minutes later from Spain's first shot on target. The result ended Spain's run of seven successive wins and they would have lost if had it not been for an inspired performance by their goalkeeper David de Gea. The hosts fielded a 3-4-3 formation and were far livelier than the pedestrian visitors, in particular Antonio Candreva. The Lazio midfielder produced a wicked cross which defender Sergio Ramos turned against his own post in the sixth minute and nearly scored with a long-range shot which De Gea turned around the post. De Gea made further saves from Insigne and Alessandro Florenzi before Italy finally went ahead in the 67th minute. They led for only three minutes before Cesc Fabregas floated a free kick into the area, Gianluigi Buffon failed to hold Alvaro Morata's header and Aduriz fired the rebound into the roof of the net. Iceland suffered a blow in their preparations for their first major tournament as they were beaten 2-1 by Denmark in an action-packed friendly. Age Hareide's reign as Denmark manager got off to a good start as Nicolai Joergensen scored twice to secure victory at the MCH Arena in Herning. After a scoreless first half in which Denmark dictated the tempo, Yussuf Poulsen created the first goal six minutes after the restart, pulling the ball back to give Joergensen an easy finish. Pouslen was involved again three minutes later, passing to Christian Eriksen, who squared unselfishly to Joergensen for a simple second. Arnor Ingvi Traustason thumped home a consolation goal for the visitors in the 90th minute. Wales sorely missed the unavailable Gareth Bale as they laboured to a 1-1 home draw with fellow Euro 2016 qualifiers Northern Ireland in Cardiff. Without the Real Madrid forward, whose seven qualifying goals propelled Wales to their first tournament finals since 1958, they barely tested visiting keeper Michael McGovern. Craig Cathcart's goal on the hour looked like settling a scrappy contest before Simon Church salvaged a draw for the hosts from the penalty spot after being fouled. Bale was unavailable as he battled back to full fitness having been out with a calf injury for several weeks. Wales' performance would not have unduly worried England, one of their opponents in the group stages in France this summer, but manager Chris Coleman said there had been some positives. Cathcart put Northern Ireland ahead when Paddy McNair hoisted a cross into a crowded area and the ball dropped for the Watford defender to turn and fire home only his second goal for his country. Coleman cut a frustrated figure on the touchline but his spirits were lifted when Gareth McAuley brought down Church and the Aberdeen player got up to convert from the penalty spot. It meant Wales avoided a third consecutive defeat and kept Northern Ireland waiting for a long-overdue victory against their British rivals, with their last win coming in 1980. Northern Ireland, who have qualified for their first ever European Championships, face Poland, Ukraine and Germany at Euro 2016 while Wales are in the same group as England, Slovakia and Russia. Cenk Tosun was in brilliant form for Turkey, scoring both goals in a morale-boosting 2-1 victory over fellow Euro 2016 qualifiers Sweden at the Antalya Stadium. The Besiktas striker hit the target with a left-foot strike after 32 munutes when midfielder Ozan Tufan put him through with a headed assist. Sweden then took control in the second half to earn a deserved 74th minute equaliser from Andreas Granqvist, who scored from close range. Both sides had their chances to earn a winner but it was Tosun who proved the decisive figure nine minutes from time, heading home Selcuk Inan's cross to leave the visiting goalkeeper Robin Olsen helpless.